Approximately 25% of individuals with upper limb loss abandon prosthesis use despite the significant functional limitations that upper limb loss can impose. While it is apparent that these devices could be improved, it is not clear what constitutes “successful” prosthesis usage or how prosthesis design affects performance. This study will evaluate performance in individuals using body-powered and myoelectric prostheses to help address these gaps in the literature. First, we will compare the ability to accurately discriminate grasp aperture and object stiffness using the two types of prosthesis. Additionally, we will compare the accuracy of movements made with the two prostheses during two planar reaching tasks: one with a timing goal and one with a spatial goal. We will quantify the quality of these movements in terms of movement straightness, smoothness, and coordination. Finally, we will determine if the movement quality characteristics found for planar movements also apply to unconstrained, three-dimensional activities of daily living.The results of these studies may ultimately be used to establish metrics to measure success with different devices or the efficacy of different therapeutic interventions. The goal of this project is to determine how the addition of power to the push-off phase of gait affects the amount of effort required to walk, the time of muscle fatigue onset, and overall activity level of patients with transtibial amputation. Each participant visits the lab four times, twice with their current prescribed prosthesis and twice with the BiOM powered ankle prostheses. Between lab visits, they will complete activity and GPS monitoring at home for two weeks, once with their device and once with the BiOM. During the lab visits, we will measure metabolic cost with the Cosmed system, collect movement kinematics using Motion Analysis cameras and software, and measure muscle activity (EMG). The goal of this research is to develop a normative database of upper extremity motions during several basic activities of daily living. The tasks they will complete include: 1) Wiping a plate with a dish towel, 2) applying deodorant to contralateral axilla, 3) grasping objects off of a high shelf, 4) turning a door knob, 5) grasping and lifting a laundry basket from the floor, 6) pouring water from a pitcher and drinking from a cup, 7) flipping pages from a newspaper, 8) cutting food with a knife, 9) picking up a phone and placing it to the ear, 10) placing pills in a pill box, 11) removing a pen cap and drawing a line, and 12) pushing a pin into bulletin board. Each participant will perform ten repetitions of each task. The three-dimensional motion of reflective markers placed on the hand, lower arm, upper arm and trunk will be collected using a motion capture system. We will determine the active range of motion of each of the joints, as well as movement time, smoothness, and synergy between the joints. The results of this study will be used to help improve the design of upper extremity prosthetics and training protocols for people learning to use upper extremity prosthetics. This will allow us to later compare the way healthy individuals move their arms to the way patients with arm prosthetics move in an effort to understand why prosthetics do not always meet the needs of patients. It is our hope that these findings will help to design better prosthetics and improve the quality of life of patients with upper extremity amputations. We are currently recruiting healthy control subjects. Please contact the lab if interested in participating! 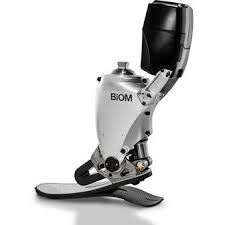 Current prosthetic devices are not capable of producing as much power as the human ankle. This prompts prosthesis users to adopt compensation strategies that may increase stress on other joints. Compensatory over-loading of the intact limb is believed to precipitate the development of osteoarthritis in the intact knee. However, estimates of knee contact forces in this population are scarce and have used models that do not account for individual adaptive neuromuscular strategies. The goals of this project is to use amputee muscle activity to develop an electromyography (EMG)-driven model of the knee to determine knee loading. We are recruiting participants with below-knee amputations! Negotiating gait over different walking surfaces can be difficult and places people at a higher risk of falls. We have completed several studies on how people adapt their walking patterns when negotiating different surfaces, such as rocks, stairs, sand, and curbs. We are currently exploring the impact of altering cadence when walking over different surfaces. Our primary goal is to understand healthy adaptations so that we might improve performance in individuals with amputation through patient training, or intelligent prosthetic devices. Many new upper limb prostheses are being designed to increase the level of control users have over their movements. However, these designs are generally based on educated guesses as to what patients will want. In this survey study, we explore: 1) how satisfied individuals with upper limb loss are with their current prostheses, and 2) what risks individuals with upper limb loss are willing to accept if a prosthesis could offer a certain level of performance. Knowledge of these two areas will direct us and others in establishing design criteria for future prostheses. If you are an individual with upper limb loss, we need your help! Participants will receive a gift card for completing the survey. If you would like to participate, please go to: tinyurl.com/UMOPsurvey. The survey may also be accessed at: https://umich.qualtrics.com/SE/?SID=SV_3DTnv98hZjIfsRD. Co-PI, C. David Remy, Ph.D. This project explores the idea of improving function of lower limb amputees with a powered prosthesis. While many such devices are currently being developed, it is unclear whether a person can use power from the device to reduce their metabolic effort, or what level of power we should provide the person. In this study we will monitor people with below-knee amputation as they walk on a treadmill wearing a commercial powered ankle prosthesis where the amount of power supplied and the time of power application can be adjusted in real time. With this data we hope to determine: 1) if increasing power supplied from a device can incrementally reduce the metabolic cost, and 2) if we can implement an online machine-learning scheme to automatically determine optimal control parameters for each individual. We are currently recruiting participants with below-knee amputations!